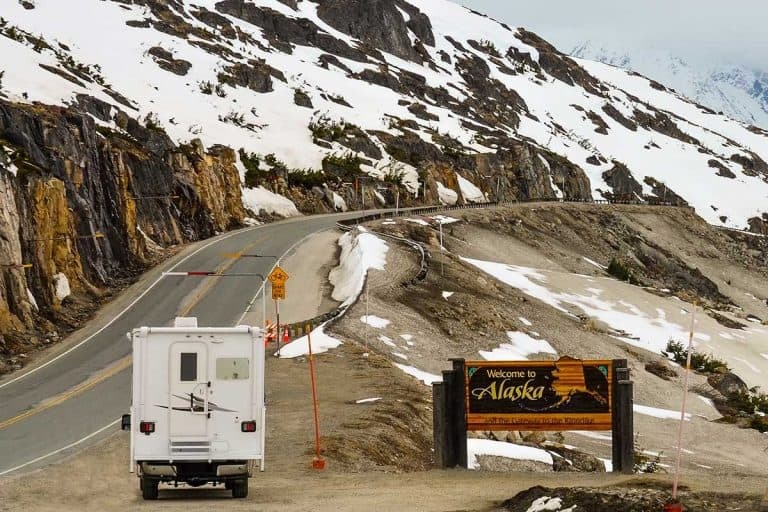 As a new RV owner, you’re probably worried about keeping your precious – and expensive – new rig safe from the elements. At this point, you’re probably wondering whether you should cover up the RV when not in use. We’ve thoroughly researched the topic to bring you this concise guide about RV covers. Although a good RV cover isn’t cheap, it’s a good idea to use one. In the long run, it’s going to save you money by protecting your RV from dirt, bugs, UV radiation and other types of damage. 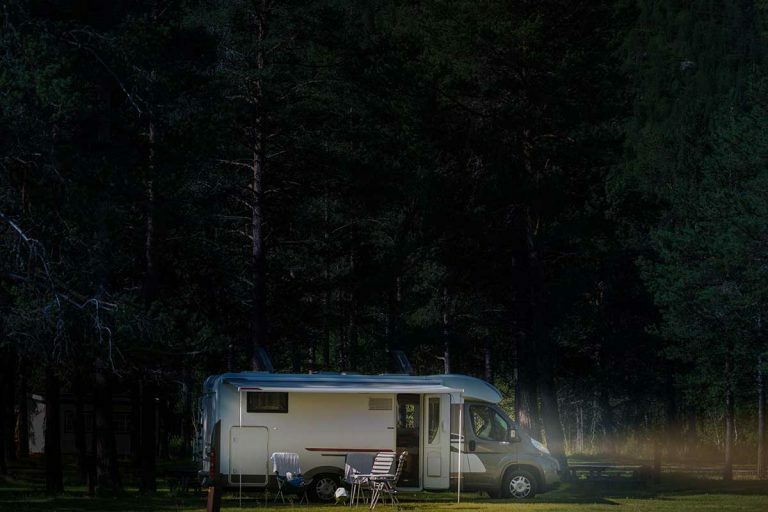 You should take care to choose the right RV cover though and invest in a durable long-term one that will actually offer that kind of protection. 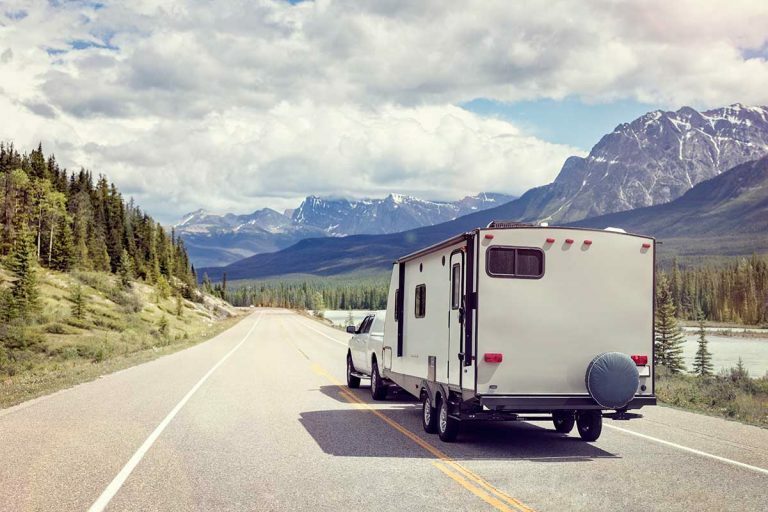 Whether you own a motorhome, a travel trailer or a 5th wheel, you should take a few minutes to learn about RV covers and how to choose the best one. 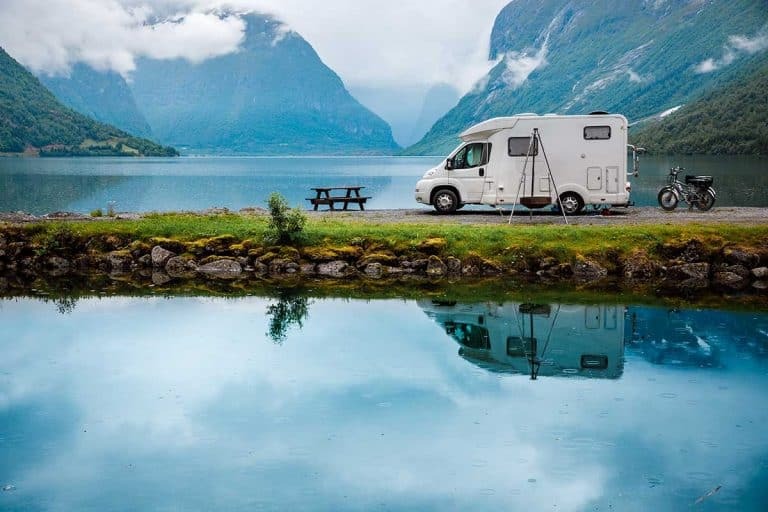 A small investment of a few hundred dollars is nothing compared to what you paid for your RV – but it’s enough to justify spending some time researching the topic before making the purchase. An RV cover is anything that you put over your RV when not in use. These covers are used to protect RVs from the elements when in storage. From UV rays to wind, rain, and snow, your trailer is subjected to quite a lot of abuse if it is not protected. You might be surprised to learn just how many different types of covers exist for RVs. From a simple square tarp to a triple-layer cover with UV protection and ventilation, they run the gamut. For anyone lacking a warm, dry indoor area to store their RV when not in use, an RV cover is the best affordable option for protecting your investment while not in use. The thing is, RV covers don’t come without some downsides. It is easy to find many sites and stores recommending a cover to anyone who asks. Of course, they are all trying to sell you a cover, so naturally, they will hide all of the negative aspects of RV covers! In a nutshell, here are the pros and cons of using an RV cover (we’ll go into them in more detail later on in this post – in reference to specific types of tarps and covers). Protects your trailer or motorhome. Reduces the frequency of maintenance tasks. Can cause some wear and tear when putting on. What are RV tarps typically made of? As with anything, some are better than others. What works best for you will depend on your specific needs as well as your budget. Vinyl tarps have a lot going for them – they possess two qualities that are at the top of most people’s list: they are highly durable and waterproof. Of course, this makes vinyl more expensive than most other materials for RV covers. For this reason, they are not the most popular choice today, even vinyl is usually considered the best material. 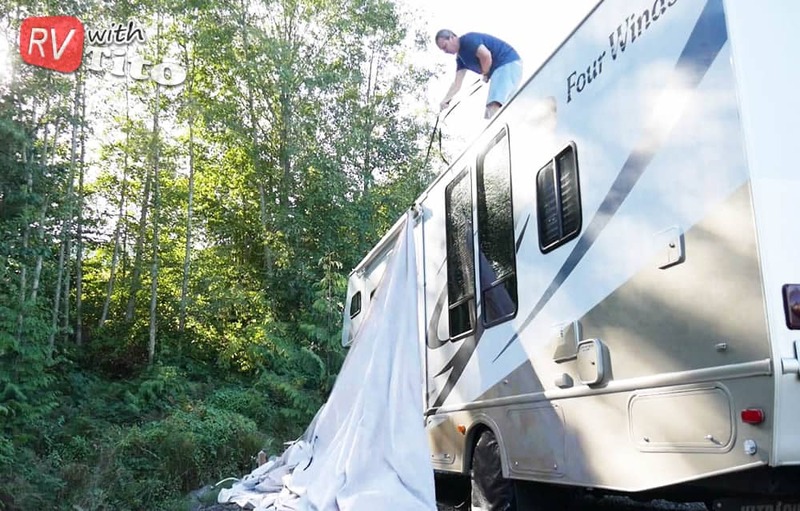 Beware of mesh tarps, for they will usually not provide adequate protection for your stored RV. While there are many good uses for mesh tarps and screens, RV storage is not one of them. Not only will UV rays penetrate it, but moisture will be able to seep in as well. As you shop around, you will likely notice some canvas tarps that appear to be a good option for your RV cover. And while this used to be a popular option, the next category has since surpassed it as the most common material. Even though canvas is a tough material that offers breathability and water-resistant qualities, the high cost, durability concerns, and lack of waterproofing deter most people from using it. 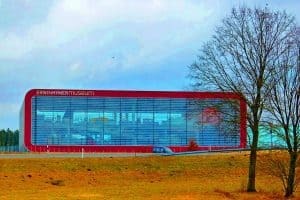 This man-made material has gained worldwide popularity thanks to its vinyl-mimicking qualities and low production cost. Likely, most of the covers you find as you shop will be made out of polyethylene or a similar material. Just choosing a tarp of this material doesn’t mean you are done, however. There are simple, cheap poly tarps, and then there are the aforementioned triple-layer tarps with custom fittings and ventilation. How much do RV covers cost? As much as you want to spend. On the low end resides the good ol’ blue tarp. 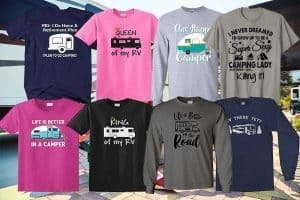 You can usually find these for anywhere from $20 to $60, depending on the size required to cover your RV. Of course, the quality will reflect the price, with most of these types of tarps wearing out after just one season of use. At the other end of the spectrum are the custom-made covers designed for specific trailer styles. You can easily spend $500 or more on a high-quality motorhome or 5th wheel cover. Like with most things, you get what you pay for, as these expensive covers will protect your RV, last for many seasons, and allow ease of access that lesser units will not. While some RV owners cover their entire RV, others opt for a roof-only cover. Naturally, the full-RV cover will provide protection to the sides of your RV, but they can also risk holding in moisture, which can cause more damage than the cover prevents. Opting for a well-made, ventilated cover will prevent this. A top-only cover will keep the top of your RV protected from the sun and snow while allowing more ventilation. Because the majority of UV, snow, and rain damage will come from the top, this isn’t a bad choice. So, if you want a cheap cover to give your RV a little protection, a top-only cover could be your best option. Despite the upfront cost of the cover, they can actually save you money in the long run. 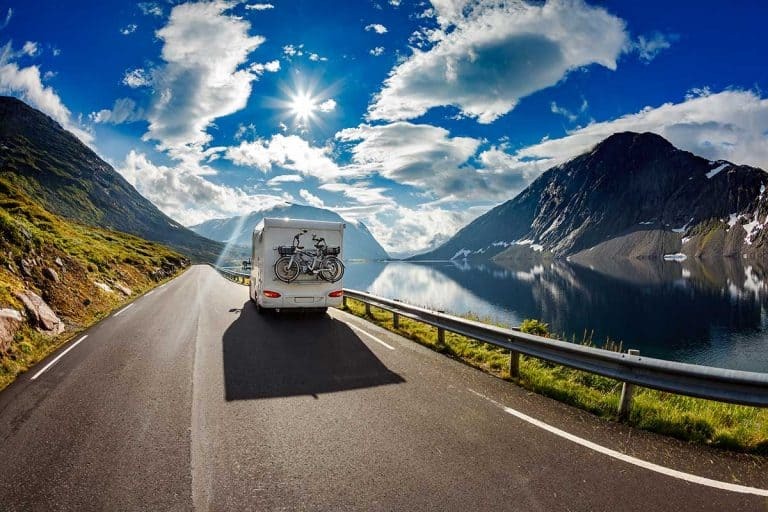 Because they protect your RV from the elements, they will reduce the amount of upkeep and maintenance required to keep your trailer, boat, or motorhome in tip-top shape. A good RV cover will also keep your RV looking pristine, increasing your resale value. To go along with the first point, any RV cover will be cheaper than paying for indoor RV storage (if you don’t have it for free at home already, that is). That makes a cover a good middle-ground choice for protecting your RV in the offseason. RV covers will keep dirt, moisture, and even bugs and rodents from making your trailer dirty while in storage. Your RV will be more pleasant to be in, look better, and be easier to maintain, all thanks to your cover. Covers also preserve the rubber seals and paint that keep your RV functioning well and looking new. The sun, wind, rain, and snow all cause your paint, rubber, plastic, and glass to deteriorate. A cover will not necessarily eliminate this phenomenon, but it will slow it down. 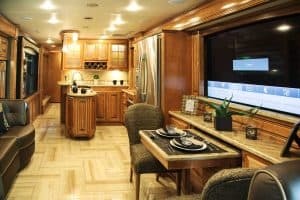 By the way, if you’re new to RV’ing, check out our post 49 about RV Maintenance Tips that will save you time and money. Installing an RV cover can be difficult and time-consuming. Climbing on top of the trailer, dealing with the huge expanse of fabric that just loves to catch the wind, and cinching the cover down can all be a huge headache. Even though a cover will protect your RV from the sun, rain, and bird droppings, the act of putting the cover on and removing it from your RV can cause wear and tear on various parts of your trailer. Also, an ill-fitting cover will move around in the wind, causing even more wear. This is especially likely with cheap, low-quality covers that do not come with tightening straps. Even though they are cheaper than indoor storage, the $200 – $500 required for a good cover still isn’t cheap. Many people opt for no cover simply because they do not feel it is worth the cost. The general consensus is that if you are not going to use your RV for one month or more, put the cover on. Typically, this will equate to using the cover during the cold winter months and leaving it off during the spring and summer. One common problem RV Cover owners run into is folding the cover-up when not in use. When you buy your cover, it will come folded up nice and neat in its package. 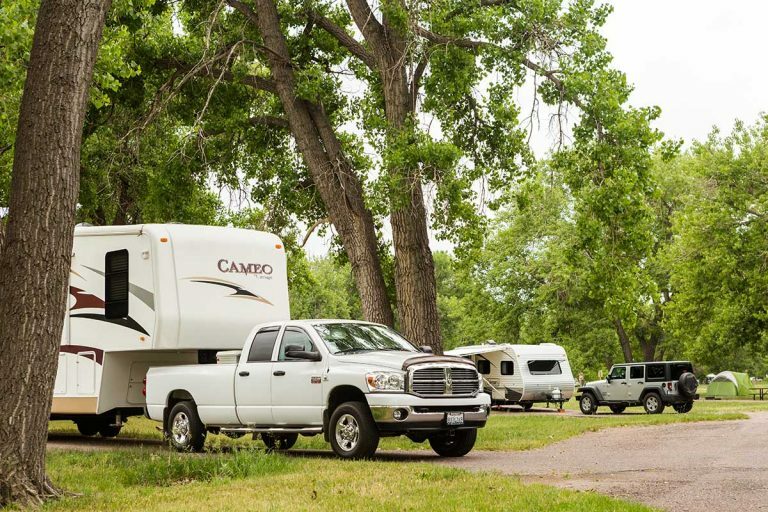 After unpacking and installing it on your RV, however, it will be much trickier to get it back in the same nice, neat shape. The wind will catch in the cover like a ship’s sail, making it hard to manage. Ditching the original folding pattern and rolling up your cover will allow the air to escape as the cover rolls. This can make it tricky to get it back in the original package, however. Some people resort to actually lying down on top of the sprawled-out cover and rolling back and forth along the length of the cover to flatten it out and remove any air inside. This makes the folding much easier, although it can be difficult for some people and you will risk looking silly. For those wanting a cheap RV cover and don’t mind doing a little legwork, a DIY cover can be a great option. While you can opt for one of those inexpensive blue tarps, they are prone to holding in moisture and wearing down after just one season. A better option, if you can afford it, is a high-quality polyethylene or vinyl tarp. After finding the right size and quality of material for your cover, ensuring a proper fit is the next challenge. Using ropes, tightening straps, and/or bungee cords, you will need to create a secure fit that is resistant to moving around in strong winds. Of course, a top-only cover will be much easier to fit than a full-RV cover if you are making one yourself. Proper ventilation is also essential if using a waterproof cover, as moisture buildup can cause as much or more damage than the cover will prevent. Next PostWhat Happens If An RV Gets Struck by Lightning?